Nord Stream 2 pipeline is a military threat to Europe. Ukraine has banned entry into the former British Communist Murray. After the Putin era, the Russian elite will split, transferring power to the security forces will be very difficult, - McFaul. In St. Petersburg, hundreds of people again came to protest against raising the retirement age. The famous writer told about the serious consequences of the conflict between the Russian Orthodox Church and the UOC-KP. Ministry of Internal Affairs of Britain does not plan to introduce sanctions against RF before leaving the EU. It became known what Ukraine could answer Russia on the blockade of the Azov Sea. NATO membership for Finland is not yet relevant due to Russia's position. Deputy Foreign Minister Lana Zerkal said in a speech at the Yalta European Strategy Forum (YES), reports Espresso. "We saw how Russia increased its military presence in the Sea of ​​Azov under the pretext of protecting the construction of the Kerch Bridge, as well as increasing the military presence of the Russian Federation in the Baltic Sea, which would be a threat to Europe," she explained. "How can Russia be considered a reliable partner if it does not respect the rules and does not comply with the agreement," she added. Ukraine has banned entry for three years, Andrew Murray, a British politician, a former member of the local Communist Party, and now Jeremy Corbyn, a Labor Leader. This is stated in the response of the Security Service of Ukraine to the request of the publication "Apostrophe", which was involved in the investigation of the British tabloid Daily Mail. The SBU officially stated that Murray was banned from entering Ukraine in June 2018. A security spokeswoman also said that the British politician was declared a non-gratuitous person through Russian propaganda. "This is not a step we take lightly, which means that it is considered a potential threat to our national security," said the interlocutor from the SBU. Daily Mail adds that Murray has been a member of the Communist Party of Britain for 40 years and in 2014 helped launch the Solidarity with Antifascist Resistance in Ukraine campaign to counteract the actions of the Kyiv authorities. After Russia annexed the Crimea and began military aggression in the Donbass, Murray used Solidarity to describe the situation in Ukraine as "a war held by the Kiev government against the people." In April 2018, it was reported that Russian bombs interfered in elections in the UK and tried to help the leader of the opposition Labor Party Jeremy Corbyn win them. After the current president of the Russian Federation, Vladimir Putin, will cease to lead the country, the Russian elite will inevitably split up. According to Censor.NET, referring to ZN.ua, former ambassador to the Russian Federation, Michael McFaul, expressed his views at the 15th annual meeting of the Yalta European Strategy (YES), "The Future Generation of All." "It's not correct to say that they are the only ones. When the era begins after Putin, one should not think that everyone in the elite will behave the same way. I think we should expect a big battle for ownership," he said. McFaul added that an attempt to transfer power to other law enforcement agencies would not find support from all the representatives of the Russian elite. "The Russians will not go beyond Bortnikov or Patrushev," the diplomat said. "I think the transfer of power to security officials will be very difficult," he concluded. In St. Petersburg, the local people again went on a campaign against raising the retirement age. On the square between the protesters and the police there were battles. This is reported by the "Media Zone". According to preliminary data, as the Air Force adds , about a thousand people took part in the action. Police detained at least three participants, writes "ATS Info". Clashes provoked attempts by law enforcement agencies to detain a woman, they began to oppose a man of the protestant. Other participants of the action became his defense. As a result of the conflict, security forces flooded several people to the ground, in a battle somebody sprayed a cartridge. 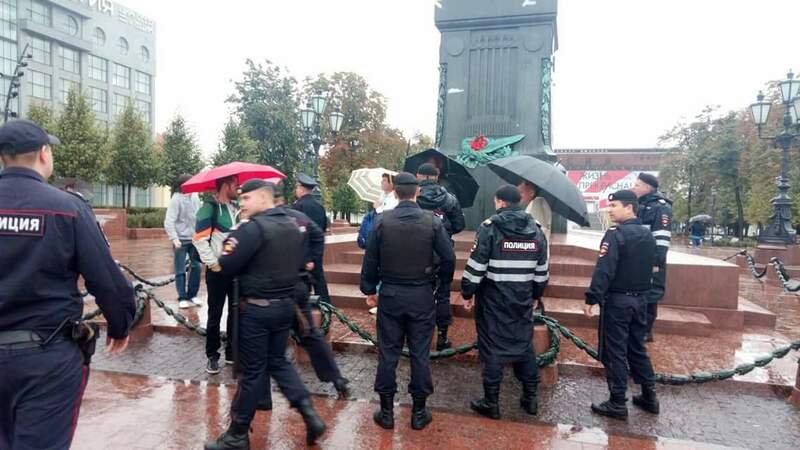 Meanwhile, in Moscow, the police detained five members of the indefinite protest against the retirement age. Among them are minors. According to the exit poll, Moscow Mayor Serhiy Sobyanin confidently wins the mayor's election on the election . READ MORE Elections and protests : how will the single day of voting on September 9 be held in Russia? The split between the Russian Orthodox Church and the Patriarchate of Constantinople because of the possible provision of autocephaly of the Ukrainian church may become the "main monument" of the Putin regime. About this on the air of the radio "Echo of Moscow" said the famous Russian writer Viktor Yerofeyev. According to him, from all recent events in Russia, including interviews with possible poisoners Sergei and Julia Skripal, as well as the challenge of Alexei Navalny to the duel director Rosgvardii Viktor Zolotov, the split with Constantinople "will remain for centuries." "It seems to me that here you know, here are all the guys who failed, and, here, Zolotov there with his wonderful performance, and so on - all this will go away pretty quickly because ... And it will remain for a century, and this will probably be the main monument of this regime of this era. Because the matter is that politics is a policy, but if we are talking about Orthodoxy as the essence of religion, this is interesting, very deep, very contemplative and in to some extent, I would even say a mystical religion ... This tree still gave to some extent, if not fruit, then, in the end, it was green. her trunk is cut in half, "says Yerofeyev. The writer believes that it was the ROC in Ukraine that gave rise to the desire to untie in the Ukrainian flock. "And it turns out that in general, there will simply be no return, and there will be a split, and the truth will be on their side, because here the church behaved like hooligans: they did not sing the boy , remember what? .. They pushed, they became an instrument of political pressure both in the Donbass, and in general throughout Ukraine. These were political dissenters, "he emphasized. Also, Yerofeyev supported Ukraine in an effort to get on the "European path" of development. "On the other hand, any manifestation of freedom from a free person is only a joy, and there is a desire for freedom." Of course, it is difficult to choose Ukraine from under the ruins of the Soviet Union, but it is gradually being chosen and it finds its own European path, What we are going to do once and for all, yes, but they went first, it's difficult, very difficult for them, and in this case Constantinople advocates for them, and it's wise to offend it simply wildly, not to mention that there's not even formal reasons to offend"- summed up the writer. Recall that in the churches of the Moscow Patriarchate they decided to stop the prayer commemoration of Constantinople Patriarch Bartholomew. In addition, they are going to stop the joint ministry of the priests of the Moscow and Constantinople Patriarchs of the Orthodox Church. Also, the ban is imposed on participation in structures under the chairmanship of Constantinople. The UK Interior Ministry does not plan to impose sanctions on Russia in the case of Violinist poisoning until the country leaves the European Union. This was stated by deputy head of the Interior Ministry of Britain Ben Wallace, reports Telephonet. Wallace explained this decision to the effect that the amendment to the British version of the Magnitude Act should be applied after Brexit. This will create new sanctions methods that can not be implemented now because of the need to obtain the consent of other members of the Union. The Telegraph notes that Wallace did not explain from what time Britain would be able to impose its own sanctions. It is expected that the country will leave the EU in March 2019, but the transition period will continue until the end of 2020. On May 24, 2018, the Queen of Britain approved the London version of the Magnitogorsk Law. The "Magnitsky Law", endorsed by the British Parliament, is similar to Canadian and American, it is more global and applies not only to Russian citizens, but also to other human rights violators from all over the world. The British "Magnitsky Law" also provides for disclosure of the names of firm owners in offshore companies in the British Overseas Territories. "List of Magnets" - a law on personal sanctions against a number of Russian officials suspected of violations of human rights and corruption, namely, involvement in one of the largest in Russia's history of theft of the budget. The law was first introduced in the United States, followed by a number of other analogues of this law, including Canada, Lithuania, Latvia, Estonia and Gibraltar. This is about the $230 million sum withdrawn from the Russian budget as a result of fraud with Hermitage Capital, an investment fund founded by William Browder of British finance. It is these machinations and opened the lawyer of the fund Sergey Magnitsky. In 2009, he was found dead in a Moscow SIZO after prolonged pressure from the security forces. At the end of December 2016, then-president of the United States, Obama, extended the "Magnitsky's law" to the whole world. Canada joined the "Magnitsky Act" in early October this year. On September 5, British prosecutors called the Russian Sergei Skripal, former Russian intelligence officer and his daughter Julia, two Russians, Aleksandr Petrov and Ruslan Boshirov, who were involved in poisoning. Britain assures - these are intelligence officers. It is difficult for Ukraine to confront the Russian Federation at sea because of the lack of maritime capital, but this can be offset by land forces and aviation. This was described by former deputy chief of the General Staff of the Armed Forces, lieutenant-general of the stock Igor Romanenko, reports " Observer". According to him, the Russian Federation has already thrown about 40 warships in the Sea of ​​Azov, including landing ships, artillery boats and rocket boats armed with "Kalibrami". Therefore, now the Armed Forces of Ukraine are preparing for the worst scenario. Romanenko said that Ukraine has just launched two more boats "Gyurza-M" in the Azov Sea. "These are artillery boats, two of the six, which are adopted. We also work on rocket boats, but it takes time," he explained. On this basis, as the expert says, it is difficult for Ukraine to confront the Russian Federation at sea. But the lack of maritime potential is offset by the Armed Forces on the account of the land forces: artillery, rocket launchers and tanks ready to fire for naval purposes. "As well as aviation facilities, these include Mi-24 helicopters, Su-25 attack planes and Su-24 bombers," the general concluded. The president of Finland, Saulius Niniste, believes that the question of the membership of his country in the North Atlantic Alliance is now on the summit due to the reluctance to have Russia as an enemy. In this he confessed in an interview with the German newspaper Frankfurter Allgemeine Zeitung on the eve of the visit of the Federal President of Germany Franco-Walter Steinmeier, informs Censor.NET with reference to Ukrinform. "The Russians clearly made it clear that now they are seeing Finns across the border, but if we were in NATO, they would have seen the enemies. That is their position," the Finnish president said. "We can not change the geography, We are neighbors, we have 1,300 kilometers of common border, about the same amount as the other EU and NATO countries together," the Finnish chief explained the desire to have a "functional" relationship with Moscow. Speaking about the president of the Russian Federation, Niniest assured that he "works well with him" and can discuss openly even "very sensitive" issues. But at the same time he noted: "Putin must be very careful when he is in. He is always well prepared, very well." The two leaders met last summer twice: during the summit of the Russian Federation-USA in Helsinki in July and in Sochi in August.